18 metre structural steel proves no challenge for the handling and stability of this machine. Access is very good with well-placed steps and grab rails. Forward vision is very good, with only the mandatory mast impeding the visibility. Internal and external mirrors are complemented with a rear-vision camera and monitor, leaving very few blindspots while reversing. We unloaded and loaded shipping containers up to the maximum lifting capacity 25,000kg gross. The largest industrial fork hoist produced by Hyundai was recently released on the world market in the form of the 250D-7E. 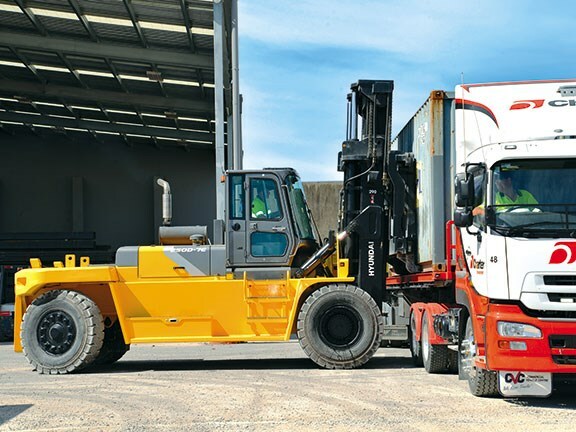 At the time of writing, there had been only two of these machines commissioned in Australasia, one in Perth, Western Australia, and one in Christchurch for local transport company Charter Transport and supplied by local agent Halbro Forklifts Limited. The 250D-7E is the new flagship Hyundai Series 7 industrial fork hoist. This heavy-duty South Korean-sourced machine has a lifting capacity of 25,000kg and an unloaded top speed of 31.7kph. Overall length, including the 2450mm fork tines, is 8812mm and it has a 4250mm wheelbase with a turning radius of 5807mm. It has a tare weight of approximately 37,000kg and runs a Kessler drive axle with oil-cooled disc brakes. The test machine was fitted with a two-stage mast and features a lifting height of 4030mm. 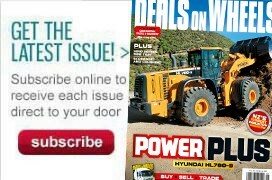 Power comes from a six-cylinder turbocharged Cummins QSC engine rated at 194kW (263hp) governed at 2200rpm. It features an exhaust gas recirculation (EGR) subsystem mated to Cummins' own compact catalyst system to achieve Tier 3 and EU stage IIIA low emission standards. There are two engine control modes in which standard mode can be selected for fuel reduction and light-duty operating or power mode for heavy-duty work, or operating loaded on slopes or gradients. 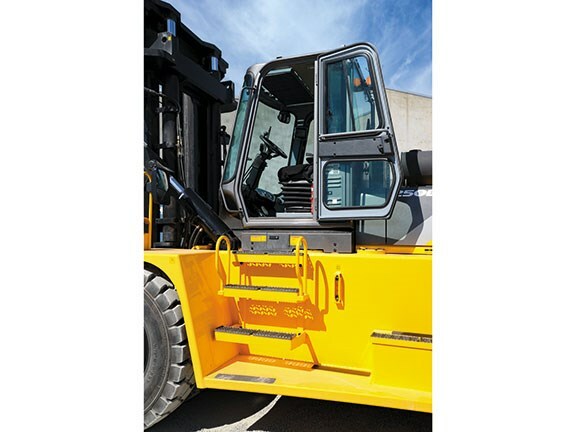 The engine is easily accessible for maintenance checks and servicing with large lockable hinged opening hoods on both sides, and the cab itself can be hydraulically tilted sideways for clear and easy access to the hydraulics. It runs a 24-volt electrical system. The transmission is a German-made ZF Model 3WG21 electronically-controlled, fully-automatic gearbox with three speeds, forward and reverse. It can also be lever-operated manually. 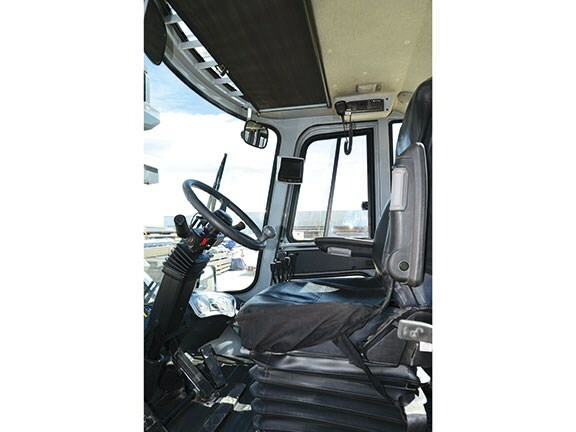 The ergonomics of the almost air-tight cab are good, with well-placed gauges and controls. There is a console to the right of the operator which houses all of the controls and switches (other than those mounted on the steering column). This console is at the optimum height and these controls and switches require no stretching or movement out of a comfortable seating position to utilise. 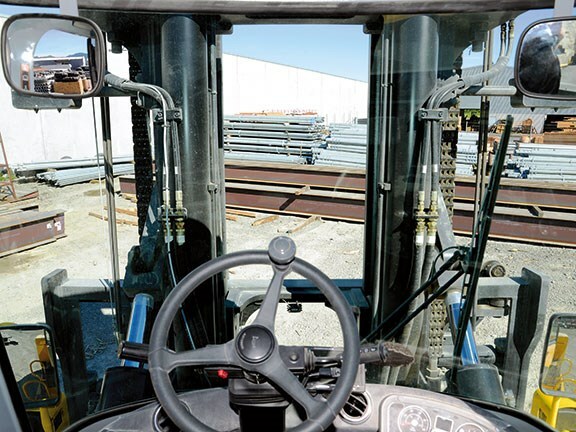 The steering wheel has a 40-degree lateral adjustment, along with 80mm of telescopic adjustment and this, as well as the adjustable suspension seat, will ensure a comfortable seating position for all shapes and sizes of operator. display, auto park brake, cruise control, air-conditioning and heating, rear-view camera, MP3 CD player/USB, headphone ports and a Hi-Mate remote management system. Storage space is limited to a couple of document holders, a small open tray and a drink/cup holder. Access to the cab is very good, with well-appointed steps and grab handles. With there being numerous seat and steering wheel adjustments, it was not difficult to find a comfortable driving position before moving off. 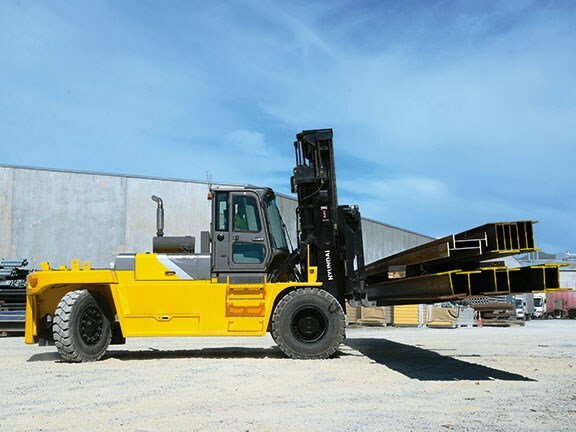 We were fortunate enough to test the 250D-7E in its everyday working conditions, including the moving of 20-tonne-plus lifts of structural steel from 12 to 18 metres in length, and also loading/unloading 20-foot shipping containers on and off semi-truck and trailer units. Some of the shipping containers weighed up to the machine's basic maximum lifting capacity of 25,000kg, which was ideal for this test. The controls were responsive and accurate as was the acceleration and disc braking. The 2450mm fork tines are compatible for lifting shipping containers and there is a 12-degree forward tilt and a 10-degree backward tilt with ample side shift, which was helpful when centring loads and loading onto container twistlocks (the fork tines can also be moved independently). The gearbox can be operated in manual or full automatic and the changes are smooth and precise in both modes. We operated the engine control mode in standard mode for most of the drive, however when we did test the power mode, we noticed a slight difference — albeit not significant enough to warrant having it selected on this mode for the duration in these test conditions. This machine handled well and felt stable at all times, even when in transit, and when cornering with 25,000kg shipping containers (including stacking them two-high). The same stability and handling was apparent when moving 18-metre-long structural steel, which is impressive considering there was more than seven metres of overhang to each side of the fork tines. Manoeuvrability in tight areas was good for a machine of this size, especially considering the fact we were operating a 25,000kg capable fork hoist in (at times) very confined spaces. In saying this, it felt very agile so that the machine did not actually have a heavy-duty feel about it during these manoeuvres. Vision from the driver's seat was exceptionally good with plenty of glass, including a roof-mounted window with a functional blind to block the sun when not required. Forward views are obstructed only by the mast itself and this test unit had been retro-fitted with a mast-mounted camera and separate in-cab monitor, which helped negate the forward-facing blindspots when lining up a lift. There are four rear-vision mirrors (two internally mounted in the cab and two externally on either side) and also a factory-fitted rear-view camera with another in-cab monitor. 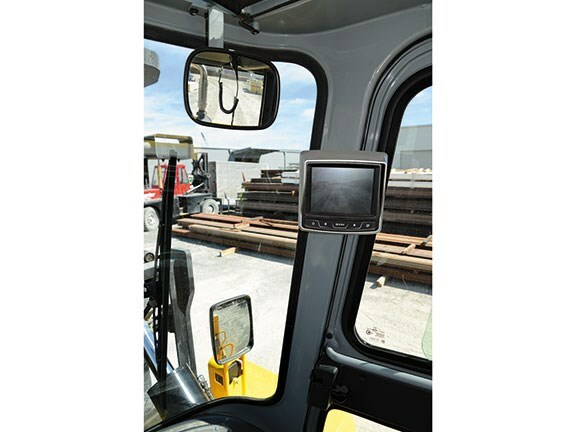 The only downside with this well-placed rear-view camera monitor is the same screen is used for the digital load sensor readout and steer wheels positioning display, meaning a button is required to be pushed to select either function. A function that switched the screen to rear-camera view automatically when reverse was selected would negate this minor annoyance. On the day of this test there was a typical hot Canterbury Plains norwester blowing, with outside temperatures of more than 25 degrees Celsius. What a perfect day to test the air conditioning, we thought, and switching on the aircon we noticed that on top of the windscreen demister vents, there were no less than eight other air vents (four forward of the driver and four behind the driver seat). Needless to say the cool air circulated the cab in no time and was very effective. There were also no less than six forward-facing LED lights (including two on each side of the mast) and two rear facing (not including the standard brake/indicator/reversing lights) for night time operation. Another feature of the 250D-7E well worth mentioning is the GPS-based Hi-Mate remote management system. This is a live, online reporting system allowing the management and service agent up-to-the-minute access on all facets of the forklift operation. This monitors a multitude of things, among them are full maintenance reports, idling/working-time reports, fuel usage, and hour and kilometre readings (daily, weekly and overall totals). It can also calculate the total weight the machine lifts per day and populates it into graphs showing totals and averages. This feature is a genuine tool to measure the performance of the machine and of course, the service agent can monitor and schedule servicing remotely. The ease of operation, versatility and almost nimble characteristics of this machine almost belie its size and lifting capacity. This is a sizable machine, yet (first impressions at least) we found ourselves having to remind ourselves of this. It was quiet, comfortable, had good vision and ample power lifting and also in transit. It was ideally suited to the operation in which it was tested and was a true 25,000kg capacity unit — in fact, it lifted these weights with ease. Oddly, the only concern we had was the ease of operation compared to the size and lifting capability of the machine. This is actually a testament to the designers, however we believe an inexperienced operator could get into trouble pretty quickly if not managed properly, as there are serious weights being lifted. This is, however, a training issue and hardly a fault of the machine itself. Is the fact there is currently only one of these machines in the country a potential problem for parts? The obvious answer of course would be yes, however in this instance, when we look at the running gear (Cummins and ZF) we note that these parts are readily available here and are spec'd in other makes and models of heavy machinery in New Zealand. 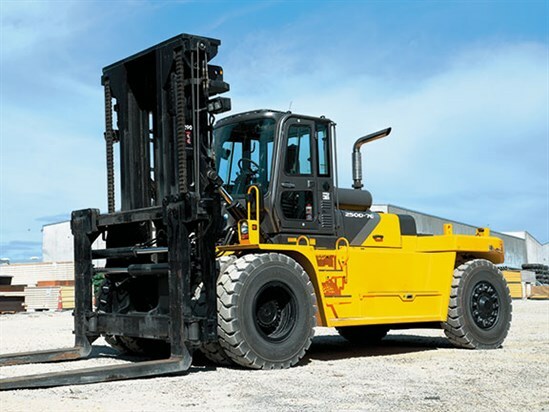 The hydraulics are not an issue and the cab itself is generic and used on smaller models so we do not foresee any major problems in this area. Hot or cold conditions, day or night, we believe the 250D-7E is certainly a contender in this fork hoist weight class.